We're looking forward to further trips, now that we're even more used to our triple kayak. The craft is built for sharing paddle experiences. We can help one another and seize opportunities. Almost nobody paddles faster than us when we exert ourselves. Ingrid and Olav in the middle are in charge of handing out chocolate and viewing the map and compass. They know where we've been and where we're going. Anne at the front is keeping a steady pace and enjoying the sun. Kurt is at the back because he's the heaviest and strongest, not to mention proudest. Paddling along is good, but paddling together with someone you love is wonderful. The best trips are still waiting for us, those we haven't yet paddled. The mountain in the middle of the picture, ahead and to the right of us, is Torghatten. Those who haven't heard the legend yet can visit us in BrÃ¸nnÃ¸ysund. 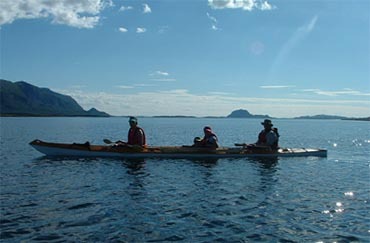 Then they can paddle with us and hear the story of what happened â€“ how the mountain was pierced through the middle. And if you're well behaved, you can even try the kayak which has a lot of space and is easy to paddle.